When I was 10, our school librarian put Mary Poppins in my hands. “I think you’ll enjoy this.” She had no idea. The book lit a fire inside me. I fell in love with this cranky nanny and the family she was determined to help. I read all of the books published up until that time and wanted more. I wrote a letter to P.L. Travers, asking if there would be more books. She answered me with a postcard. I cherish that card to this day. On August 27th of that year, Walt Disney released the movie version. It wasn’t exactly like the book. 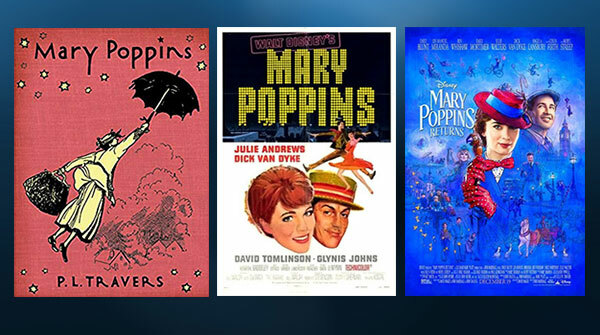 This Mary Poppins was stern but you could tell she had a sense of humor. Her loving nature was more apparent than the book’s Mary Poppins. What’s more, there was singing and dancing. My mother took me to the movie and she bought me the LP. I look at the LP now and it’s quite worn. I remember every word to every song in that movie, most especially “Feed the Birds.” We didn’t have access to interviews from every angle about everyone in and behind the movie. It was all magical. And now there will be a movie sequel. It’s about time. I am grateful that I still feel the magic so strongly that I’m excited to see the new movie! That’s just one of the powers that books have.